The travel industry is quickly changing to adopt artificial intelligence (AI). However, it has yet to make effective use of the rich data that the industry has accumulated over the years. As a solution, MyCelebs—a global AI agency that prides itself on the strength of its pragmatic, efficient, and business-ready approach to AI transformation—provides a collaborative opinion recommendation service engine. Travel options are constantly updated to reflect not only the most recent trends and proclivities of the general public but also opinions on most exotic and novel travel options. Public opinion is automatically mined through a set of natural language processing (NLP) algorithms that utilize semantic and sentiment connotation behind reviews of travel destinations and activities. Robust voice user experience (VUX): Innovative ML-based voice recognition system based on semantic and relational analysis of natural languages in reviews offer state-of-the-art recognition rates even against inarticulate and unstructured sentences. Context-aware recommendations: Travel options are recommended based on up-to-date semantic analysis, liberating connected consumption from metadata to incorporate people’s opinions and tendencies. End-users are able to plan using ambiguous search terms such as Christmas or silent travels. Operational excellence: Automatized process and updates significantly lower operational expense, pushing fares and costs down even further. 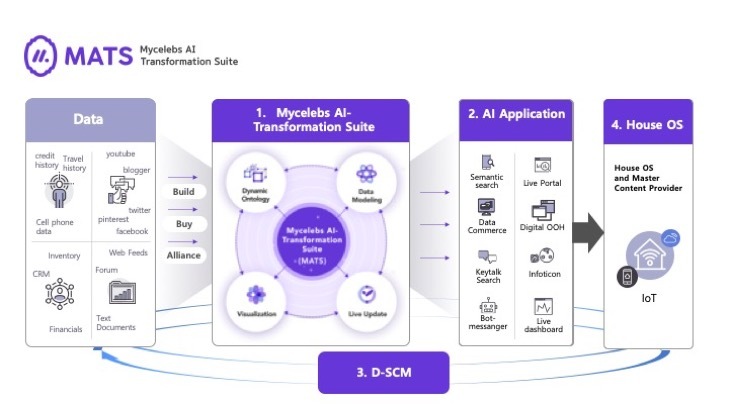 To facilitate the implementation and operation of various AI-based application services for a wide array of clients, MyCelebs developed an AI and data processing solution, MyCelebs AI Transformation Suite (MATS), on AWS. The key idea behind MATS is the dynamic ontology mechanism that allows solutions to integrate relational information of search terms. Dynamic ontology system uses an embedding-based Keytalk algorithm, which provides an innovative recognition and analysis system by incorporating Word2Vec inspired semantic analysis of public opinion, TPO (Time, Place, Occasion), and other characteristics (i.e. color and texture image recognition models). Keytalk objects are designated using conventional words but embody various tastes and intentions that a word possesses based on adjacency and similarity of various expressions within documents as well as different categories of attributes. The information adjacency among words and other context information greatly enhances the articulation and structure recognition rate compared to other VUX as well as colorizing search results by adhering to a wide array of public opinion. MATS offers not only improvements in opinion-mining search terms but also visualization methods to complement the entire VUX. MyCelebs has been modularizing, implementing and deploying various tools to allow users to naturally continue user experience, regardless of the device environment and companies to understand the implementation process and maximize workflow. MyCelebs aspires to be the most pragmatic AI agency: Data collection, visualization, ML-based intelligence embedding, and updates are done through a single, immediately-applicable solution. MyCelebs has proven its usefulness in a number of companies in various fields and has applied for and is holding total of 84 patents in the Korea, U.S., China, and Japan markets. MyCelebs defines two important concepts as a leading AI startup: data supply chain management (D-SCM) and House-OS. With each client, they aggregate data from the client as well as external sources through build-buy-alliance method. AI services are then deployed, and data is once again collected, processed and relearned using generated user feedback and log data. D-SCM defines this continuous cycle of data collection, deployment and recollection, of which AI agencies are able to act as a data aggregator. The most influential strength as an AI agency lies not in each algorithm and application it provides but in the amount of quality data that is used to create services. Whereas a single service can only gather and utilize restricted collection of datasets, MyCelebs works with multiple services in different fields and is able to create shared cross-domain data. Their models can then recognize difference between contexts in each domain and greatly enhances voice recognition rates and impact of service models compared to any other services. More importantly, MyCelebs is rapidly aggregating diverse data, which will play an important part in creating an all-inclusive language understanding model for future Home-OS environments. Currently, IoT devices with voice interface requires users to call out a designated name and has limited number of functions. However, as the number and quality of interactive devices grow in home environments, IoT objects will be required to understand natural speech more explicitly. One large network, Home-OS, will at one point be necessary to translate human speech and deliver commands to correct IoT objects. With data aggregated from D-SCM, MyCelebs is working towards more in-depth understanding of voice interactions required for building context-aware House-OS. MyCelebs is rapidly expanding their business in a large number of domains and clients; to support this, the engineering team has been evaluating different methods to keep up with rising need for computing capacity. In order to maximize workflow and resources required to develop business solutions, they had to quickly mitigate analytics issues, such as gradual and rapid application of multiple analytical models and parallel verification of each and every learning model. Before adopting Amazon SageMaker, the team used Amazon S3 for collecting and storing source data, and EC2 for data pre-processing and selecting, learning, and deploying ML model, but on-premise GPUs were used for actual analysis. This led to complications in applying efficient data distribution of multiple domains, parallel processing, and application and verification of multiple analysis models. The solution was Amazon SageMaker. Selection and learning procedures of analysis models became simplified by using Amazon SageMaker and Docker. Specifically, the ML analytics result verification process became automated by using both Amazon SageMaker and AWS Lambda. Models not supported by Amazon SageMaker were also easily implemented by using Docker-based Bring Your Own Algorithm (BYOA). After the integration, the team believes that 1) they are able to start analysis with any types of source 2) no additional system implementation or management process is required, 3) multiple analysis models are can be automatically processed, 4) they can easily integrate the service with currently using AWS products and reduce solution development time thanks to the high performance of the default model provided by SageMaker, 5) they can easily adjust resources required for multiple projects, 6) the overall analysis process efficiency has improved, and 7) ultimately, the overall internal workflow efficiency has improved by five times. Finally, MyCelebs will further focus on the AI service agency business by actively using AWS Machine Learning Technical Stack, including Amazon SageMaker and Amazon Forecast, as well as Alexa Skills. While solidifying the market segment leader position in Korea and increasing sales, MyCelebs plans to expand its business to global market segments such as North America, China, Japan, and East Asia, through Go-To-Market collaboration with the AWS ML Partner team and discovery of global partnership opportunities.